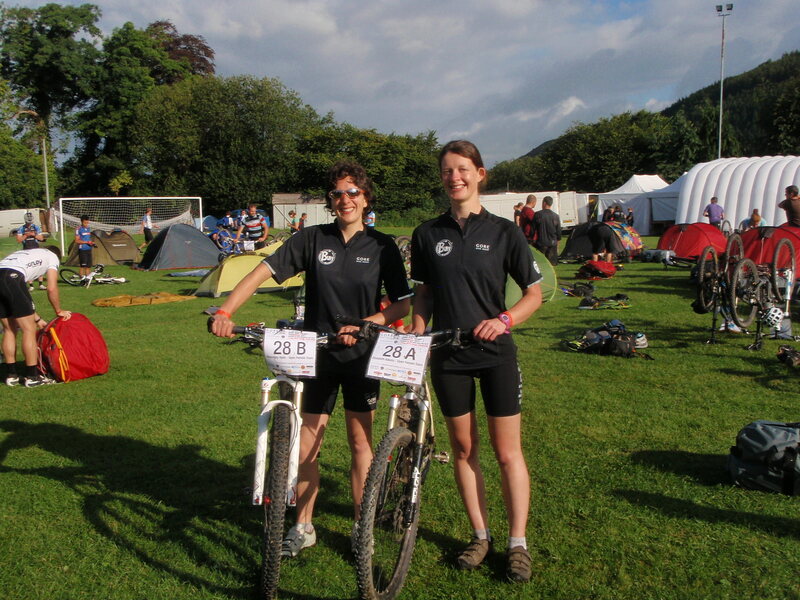 The Trans Wales became one of my ‘3 big events for the summer’ after I was persuaded to enter by fellow adventure racing friend, Elizabeth. We were riding as a female pair, with Rachel Henderson also putting in an appearance in the solo category. And so it was we lined up in Builth Wells last week to start what was to be the last edition of this classic race. The format was 7 days of mountain biking place to place. Each day consisted of a long ‘linking stage’, which was not a race but had a cut-off time. If you got back on time you were given a ‘race time’ equivalent to the cut off. If you got back late you accrued penalty seconds at the rate of 1 per minute. There were also six short timed race sections which ran at some point out on the course during the day. These ranged from 2 to 8km long, were mostly at trail centres and included a hill climb, a descent, some up and down loops and a night stage. For team pairs, the result was averaged and added to the overall time. The racing added a bit of spice to the event, but we had gone to enjoy ourselves, ride somewhere different and, in my case, give my shiny new bike (Lynskey titanium 29er hardtail) a proper testing out! I never anticipated how this event would feel – there was a great sense of camaraderie, the food that appeared in the inflatable marquee every night was plentiful and tasted good and everyone had tales to tell at the end of the day. The laidback feel extended to the publicised distances (I learnt that every day was pretty much the same; 60-70km, 5-6 hours in the saddle and the profile would go something like up, up, down, down, up, up ….) and the social events. On one night after we had finished riding it was announced that the band would start at 8pm. This was the first we had heard of a band and was when we were at the most remote camping spot in a field full of midges! After a day or two of riding under my belt, I found that the new bike (and disc brakes!) inspired confidence and I was cheerfully cruising down and over stuff I wouldn’t have dreamt of riding before. I also discovered the terrain it was perfectly made for when we rode a rocky byway with many stream crossings. I had been told that big wheels ‘roll better’ – but would I really notice anything different? The answer was a definite ‘Yes’! I could come almost to a standstill on a rocky riverbed, then give a little push on the pedals and suddenly pop over an obstacle and onwards. My body can also vouch for the total comfort of this bike as nothing is now hurting! Rachel also made a reputation for herself and climbed onto the podium on the final day to collect a popular special award for being the ‘toughest and most cheerful ever tail-ender’! All in all, a fantastic event and a great result. Next year they are changing the format, but if the atmosphere and organisation is anything like this one I would highly recommend it. Me and Elizabeth showing off the leader's jerseys!